Toyota estimates the donation to equate to 30,000 trees. To date, TMHU has planted more than 50,000 trees through the Arbor Day Foundation. "We're pleased to have Toyota Material Handling's commitment to preserving and improving our environment," said John Rosenow, founder and chief executive of the Arbor Day Foundation. "The National Arbor Day Foundation is proud to have a partner in Toyota to help restore critical ecosystems people and wildlife depend on to survive." Toyota is the world's largest supplier of lift trucks, which are used in applications ranging from retail to food and beverage warehousing. TMHU recently unveiled its new 8-Series large capacity 8,000 - 17,500 lb. cushion and pneumatic lift trucks, which include newly designed diesel and gas engines that enhance performance and fuel economy. Designed to reduce engine emissions and fuel consumption, once again, Toyota leads the way in environmental performance. "There is long standing commitment to the environment at Toyota, not just through our product innovations in electric and low emission IC forklifts, but also through our zero landfill manufacturing practices implemented at Toyota Industrial Equipment Mfg., Inc.," said Jeff Rufener, president of TMHU. "We make it a priority to support, appreciate and respect the environment." The National Arbor Day Foundation is a nonprofit, environmental education organization of nearly one million members, with a mission to inspire people to plant, nurture, and celebrate trees. 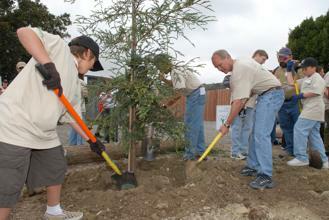 More information on the Foundation and its programs can be found at www.arborday.org.